Matter has anti-matter, Superman has Green Kryptonite, and now Google Glass has anti-Glass? Researchers in Japan have come up with a novel way to keep your face out of other people's snapshots taken on digital cameras, smartphones, and possibly Google Glass. The researchers equipped a pair of glasses with 11 small, near-infrared LED lights strategically placed around the bridge of the nose. The lights, visible to most digital cameras but invisible to humans, obscure the areas of the face that cameras and software typically rely on to identify a human face. Whether a camera is trying to focus on a face, or a software program is trying to identify who you are, these glasses will make that job much harder, the researchers claim. The glasses were developed by Isao Echizen, associate professor at Japan's National Institute of Informatics and Professor Seiichi Gohshi of Kogakuin University. The concept was originally announced in late 2012, and we briefly covered the story in its early days. More recently, Tokyo-based news site DigInfo.tv caught up with the privacy glasses during a public demonstration of the privacy device. 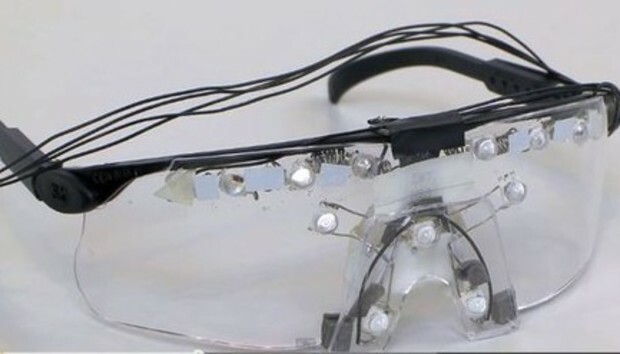 The researchers also displayed a second pair of glasses that use a reflective material to counteract imaging devices unaffected by infrared light. Physical privacy measures like this also take on new meaning as privacy fears grow spurred on by facial-recognition software and ubiquitous surveillance by wearable technology. Since human beings can't see light close to the infrared spectrum, only machines will be stymied by the new specs. Mere mortals can still recognize you and may not even realize you're wearing privacy goggles. Nefarious cyborgs hoping to snap a discrete pic of your face using Google Glass, however, may be out of luck. Here's the full video shot by DigInfo.tv. The privacy visors are only a prototype at this point, so this isn't something you'd want to wear on a day-to-day basis--Google Glass looks downright fashionable by comparison. Nevertheless, anti-Glass may be just what society needs as concerns grow that personal technology is turning the entire population into a crowd-sourced collection of security cameras. On Tuesday, nearly 40 data-protection authorities from countries such as Australia, Canada, Israel, New Zealand, and Switzerland voiced their concerns over Google Glass in an open letter to CEO Larry Page. The privacy hawks want to know about any privacy safeguards Google has put in place for Glass, what kind of personal data Google obtains via Glass, and the ethical questions about the "surreptitious collection of information about other individuals." The authorities are also concerned about facial recognition. "While we understand that Google has decided not to include facial recognition in Glass," the authorities wrote. "How does Google intend to address the specific issues around facial recognition in the future?" Google in late May said it wouldn't add facial-recognition technology to Google Glass until strong privacy protections were in place. This isn't the first time a major tech firm has raised fears about personally identifying people through photos. Facebook came under scrutiny in 2011 and 2012 after introducing a facial-recognition feature that let the service automatically tag friends in your photos. To avoid a backlash from the Europe Union, the world's largest social network deleted all facial-recognition data for its users on the continent. Note: desktop software such as iPhoto and Google's Picasa have offered facial-recognition features for several years. But is it really worth it to buy a pair of special glasses just to prevent computers from recognizing you? If you drive a car or have a passport, the government already has your face. And almost every foreign visitor to the United States is photographed and fingerprinted before entering the country. The Center for Democracy & Technology spelled out its concerns for facial recognition and privacy in a report last fall. The CDT focused not only on concerns about government use of facial technology but also private industry's use. Technology such as digital billboards known as "smart signs" are already available and can calculate a person's age and gender to target advertising to passersby, the CDT said. These signs can also figure out how long someone watches an ad and react to the watcher's emotional states. Even though these signs aren't equipped to identify individuals, it's not a hard leap to see how large corporations would be tempted to use facial recognition to better target individuals with smart-sign advertising. Facial-recognition technology could enable "any marketer, agency, or random stranger to collect--openly or in secret--and share [those] identities," the CDT said. "Databases built from commercial use of facial recognition can be accessed or re-purposed for law enforcement surveillance." It's still not clear if facial-recognition technology built into Google Glass or your favorite smartphone app will eradicate personal privacy. But if the concerns become strong enough, these Japanese privacy visors might be the beginning of a new market for personal anti-surveillance gear.